One of the little issues with the house is that the wifi and the DSL are on one end of the house, where everything is nicely networked with Gig-E, and most of the wireless clients are on the other end, where there’s no data wiring at all. And, there are either a couple of exterior walls or a really solid door in the way. 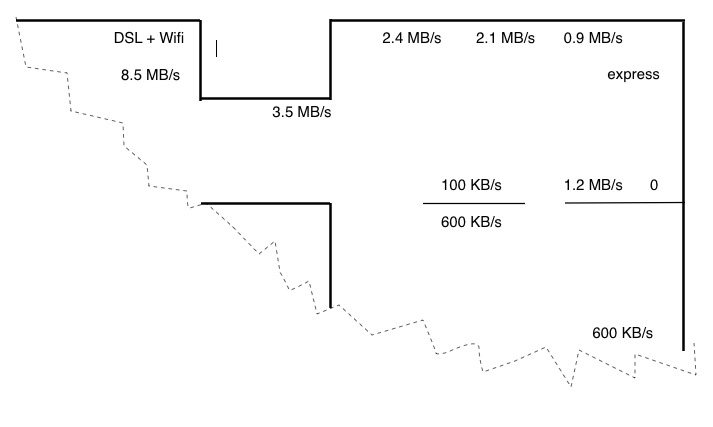 So, in the main living area, I’m seeing 300k/second transfer speeds over a wireless A/B/G/N network. Enough for a iTunes stream to the airport expresses, but not enough to reliably do streaming movies. While it might be possible to get into the little attic spaces and run some ethernet, it’s not for the faint of heart or those sensitive to confined spaces. So, I was hoping that I’d get powerline networking (HomeAV) to the rescue. Picked up a Netgear XAVB1004-100NAS, as it seemed to get decent reviews from Newegg. Nominally, it’s 200Mbps, or full duplex 100. Practically, it’s… less than that. On a single extension cord, with both halves on opposite sides of the same plug, I got about 8.5 MB/sec, which is within spitting distance of fully saturated. Unfortunately, that’s with only about an inch of copper between them. On the same branch circuit, it’s not bad, and you still retain most of the performance. But once you cross the breaker box, it’s all downhill from there. The most convenient plugin spot had only marginally better performance than using Wifi, using one of the airport expresses as a repeater. (That’s the 900k/second spot). I was planning on running the powerline networking there to give the airport express an ethernet connection to extend the wifi, but there was very audible interference through the stereo speakers. 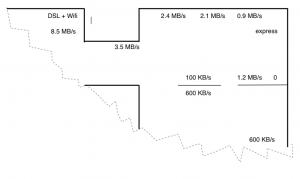 So, falling back to plan B, I mapped out the bandwidth of the powerline networking to all the outlets in the main room. The next most convenient locations all had worse bandwidth, including one location that only got the occasional ping through, but no data to speak of. Plan C, the final idea, was to put the Airport base station in the entry way, and connect it to the fastest outlet that isn’t in my office. At least that gets it through the door and in a near line of sight to most of the wireless clients. It’s a run of less than 20 feet, and still I lose about half the available bandwidth. But it projects the wifi into the living room far better than before. It’s also enough to get Facetime into the far corner of the house, at least, if you set the iPad on the right part of the table. There’s still a little interference with the stereo noticable only when the house is quiet, but a ferrite bead on the power cord cuts it by half or more. It’s only when there’s a bunch of network traffic, not constantly on the carrier like when the powerline networking plug was on the same outlet. Ultimately, the solution is to climb into the attic, crawl through some small person sized holes, drill some cable sized holes, and run some cable. But that’s not going to be an easy or clean job that I can do in an hour in the evening.